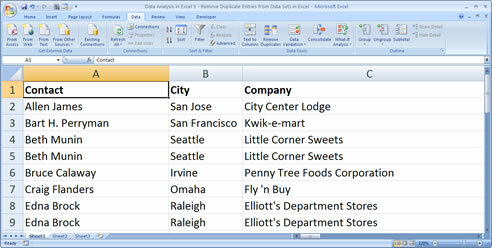 This Excel tip shows you how to Sort Data Alphabetically and Numerically in Excel 2007. This is a great feature to use when analyzing and organizing large sets of data and it can help to make sense out of all of that data. 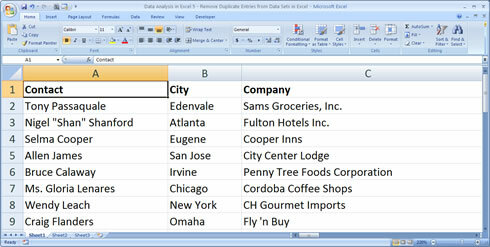 The sort feature in Excel allows you to very quickly sort any data set alphabetically and also numerically. That means A-Z, Z-A, 1-10, and 10-1. Basically, this is sorting data forwards and backwards. Select a cell within the data set which you would like to sort. Go to the Data tab in the ribbon menu. Click "AZ" to put the list or data set in alphabetical order or in numerical ascending order so that the lowest values are at the top. OR Click "ZA" to put the list or data set in reverse alphabetical order or in numerical descending order so that the highest values are at the top of the list. Note: You may or may not have headers for your data. Excel doesn't care if you have headers but it will try to determine on its own whether or not your data does contain headers. Also, this method is a very quick way to sort your data alphabetically or numerically. If you need to you can perform more advanced sorting methods in Excel by clicking the button to the right of the two small sort buttons in the ribbon menu.